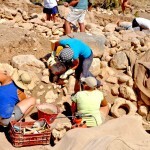 In the previous installment (Archaeological Digs – Part 1), we told you how the ancient site at Priniatikos Pyrgos was excavated by archaeologists. In this report we consider what happens to things found during the dig. 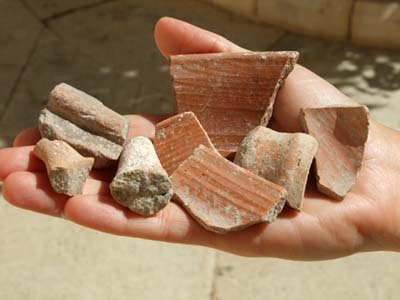 Unearthed items are studied to learn about the people and culture that created or used them. Afterward these objects may become part of a university collection (for future analysis) or put on exhibit in a museum. However, what you see in a display case may be very different from what an archaeologist uncovered. More often than not, the excavation crew finds bits and pieces encrusted with ancient dirt, corroded beyond recognition, or disintegrating upon exposure to air and sunlight. Even large artifacts – such as statues – are often found broken and embedded in hard layers of soil or ash. However, there are specialists who can preserve these ruins and transform them into objects that can be studied and appreciated for their utility and beauty. 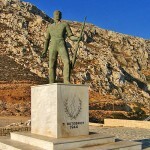 At the Center we learn how research and conservation specialists work with the finds from Priniatikos Pyrgos. 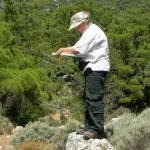 The first priority of every archaeologist is to ensure the survival of things found. This is usually the responsibility of specialists called conservators. 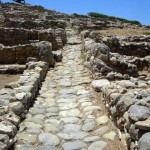 Their work is time-consuming and expensive – often costing more than the original excavation. Without conservators, however, artifacts might disintegrate and important historic data could be lost forever. The loss is not just to the excavator but also to future archaeologists and students, who may want to re-examine the materials. Most objects arriving from the excavation must first be cleaned, and this boring task is usually done by archaeology students and volunteers. 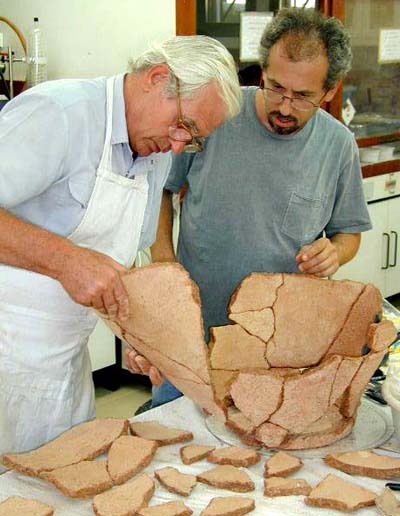 Excavation supervisors select only those items that can be washed (some items might be damaged by water), and assign each worker an allotment of potsherds and other fragments. Each cleaner is given a plastic basin, a toothbrush and other small tools needed to carefully remove the dirt. Then the cleaners find a shady place to work – it is too hot to sit in the sun. The washed objects are spread out on screen drying tables according to codes (from labeled bags), which indicate precisely where the pieces were found in the excavation site grid. Since related pieces – of a broken vase for example – are usually found in the same location, good record-keeping pays off. Without precise excavation notes, artifact labels and orderly handling methods, you could not keep track of the pieces needed to restore the vase. Dried artifacts are moved to the stoa, a covered work area used for the processing and sorting of potsherds and other finds. 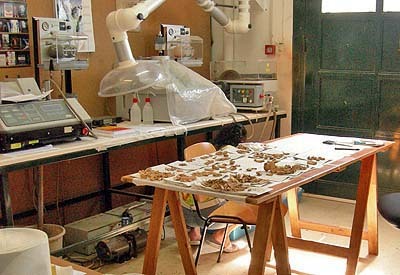 Here the senior archaeologists will select specific items for further analysis or conservation in various laboratories. Finding out how an ancient artifact is made of can answer many questions. Identifying what sort of clay was used to make a ceramic bowl, for instance, points to where the bowl was manufactured, because no two clays are exactly alike. Knowing what was added to the clay and how it was worked can even indicate when the bowl was made and who made it. Pottery production methods vary among groups of people and at different times in history. with human remains, X-rays can reveal bone structure indicating gender, age, illnesses, injuries, or even burial practices. Researchers also explore the microscopic realm. In one laboratory special tools and treatments are used to produce very thin sections of ceramics, which can then be viewed under a microscope. This is a very accurate way to classify and date pottery finds. 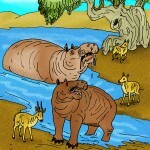 It also helps researchers understand how ancient potters selected materials and made their products (such as clay recipes and vessel forming techniques). It even provides insights into the people who used the pottery. For more detailed study, the Center also uses Laser-Induced Breakdown Spectroscopy to do elemental analysis of various ancient materials including metals, ceramic glazes and decoration. A tiny bit of the sample is vaporized by a laser beam and then passed through a spectroscope, which reads the light waves (or spectra) produced by elements in the sample. This reveals the exact composition of the material. All work done at the Center is carefully documented, and decisions are made about the stability, preservation and restoration of the objects. Unstable materials – those likely to deteriorate – must be preserved so that they can be studied at a later time. 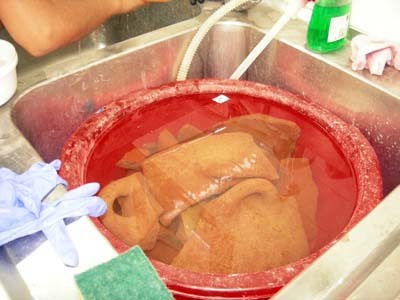 Every method used in treatment is carefully documented and a sample kept of the material. Depending on how important they are, some pieces get more attention than others. 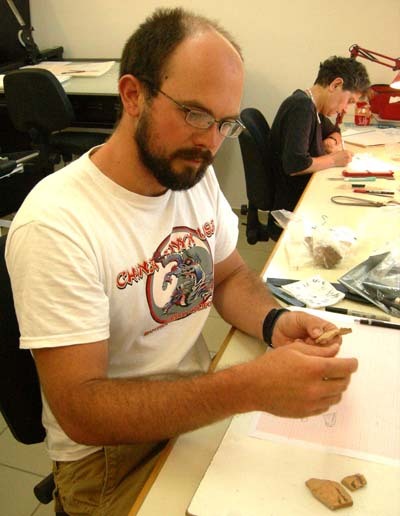 The Center employs a team of artists who create graphic images of archaeological finds. These are very technical and precise – showing geometric form and detail – so that researchers and students can compare the data with finds at other locations. Different treatment methods are used to preserve objects at risk of deterioration. Conservation may involve removal or addition of material. For example, rust or mineral deposits might be removed from an object, and new materials might be added to reconstruct an object. Procedures can include ultrasonic treatment and electrolysis, special handling and packaging, or even the creation of special atmospheres (such as moisture-free or air-tight storage). In one lab we see pieces of pottery soaking in water, and ask about it. A specialist explains they are leaching out sea salt that had seeped into the ceramic. Salt can eventually destroy the pottery, so it must be removed. Many people think a conservator is someone who takes care of museum collections. Although some conservators do work in museums, many play a critical role in archaeology. We spend some time watching conservators restoring artifacts in their laboratory. The chief conservator is carefully cleaning a small piece of fresco that might eventually be reassembled with other pieces to create a work of art. This stage, however, it is just a piece of encrusted plaster, which must be cleaned very carefully with special solutions in order to avoid damaging pigments a Minoan artist used to paint the fresco. 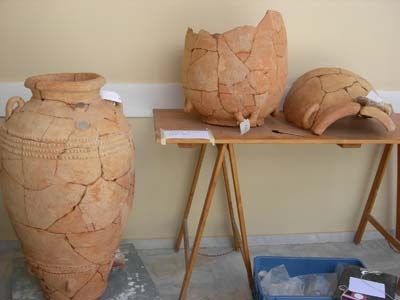 On the other side of the laboratory, two conservators are reconstructing a large pythos (storage jar) from many pieces collected at the excavation site. It is like trying to solve a big, three-dimensional jigsaw puzzle. Elsewhere we find restored artifacts waiting to be crated for shipment to a university or perhaps a museum. Each of these pieces represents days – maybe weeks – of labor at the excavation site and many hours of specialized technical work in the Center’s conservation laboratories. Following the steps that take an ancient artifact from the excavation, into the laboratory and towards a museum or university collection, we begin to understand how technical and complex the entire process can be. The most important requirement is the need for keeping very thorough notes. Without a complete record of everything collected and done at the excavation site, and all the work accomplished in conservation laboratories, important knowledge – perhaps even archaeological treasures – might be lost forever.